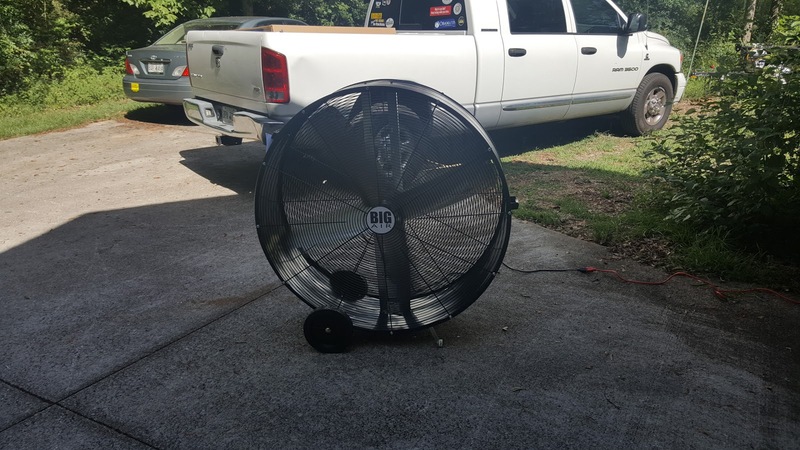 I got a big fan to help out with the hot humid weather. Having a little breeze while working in a garage or out on the driveway really helps. 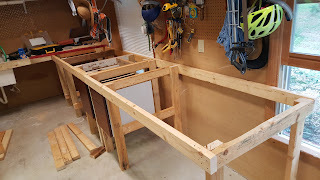 This past Friday, Saturday and Sunday I worked to finish the frames for the two six foot work benches for my shop. 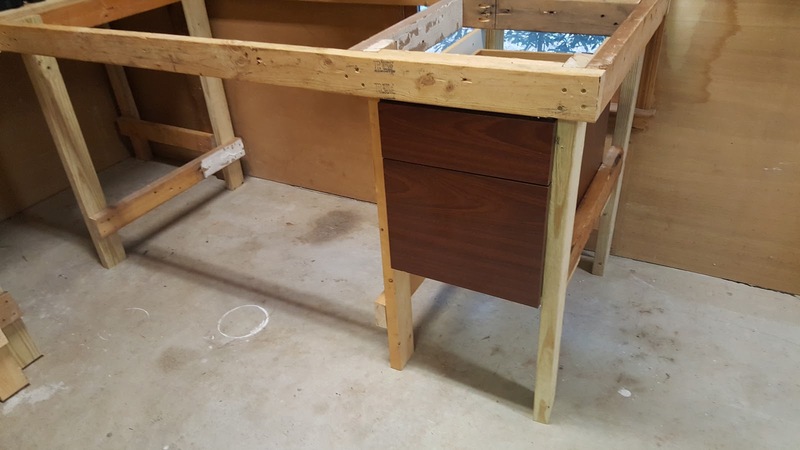 I had an office desk that was purchased used at a garage sale in Austin, Texas that was too big for the house so it was used as a work bench in my garage. 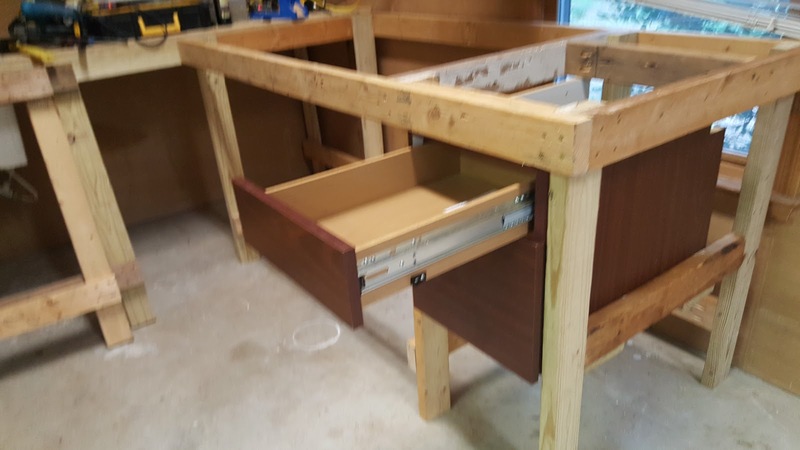 I wanted to repurpose the four drawers in my new work bench. I will use the other parts on future projects. 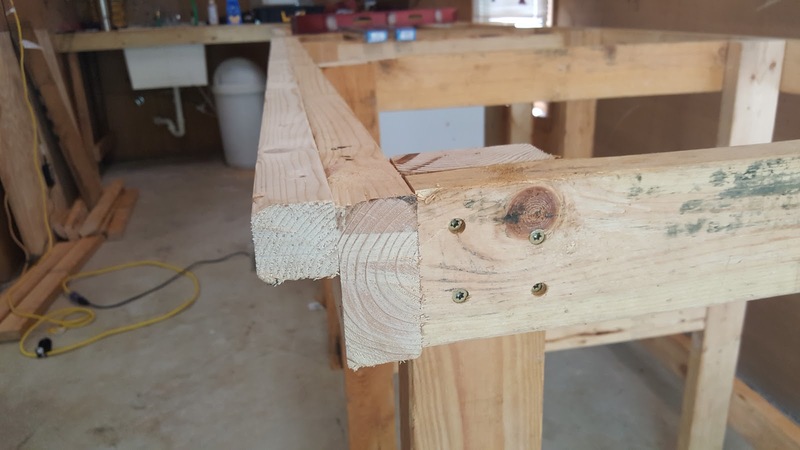 All of the 2 x 4 framing was built from wood taken out of the master bathroom. 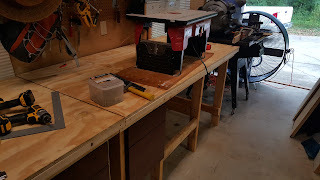 I also fixed the shop vacuum so that it fit snuggly on my tables saw. 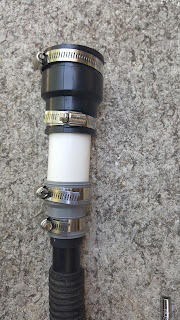 I got some pipe fittings and cut one of the vacuum extension tubes and it works great. I still have a lot to do to get the saw set up the way that I want, but for now I can make consistent cuts for multiple pieces of wood quickly and accurately. One of the things that I will make improvements in is my methods of measurement. currently I am doing rough carpentry and I use a sharpie felt pen to mark my cuts. I use my 8 inch Skil Saw made in 1952 to cut long pieces of 2 x 4 or to rip sheets of plywood. 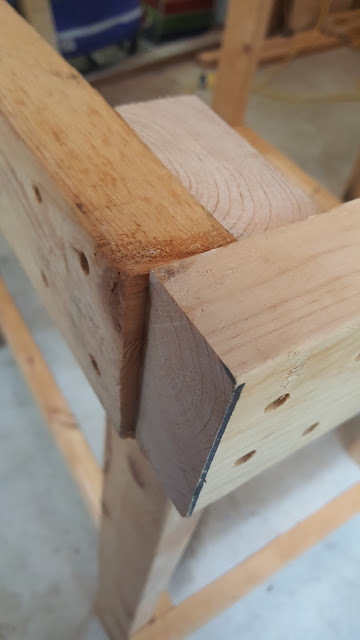 I can cut with my Skil Saw to within 1/8 of an inch. 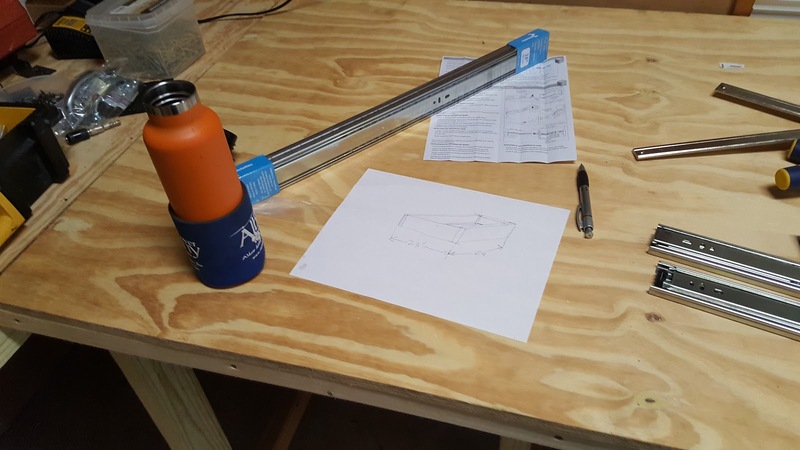 This is OK for building a work bench, but sometimes the tolerances stack up and I have to make adjustments. 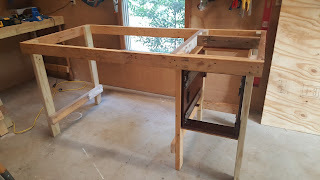 I ran into a few issues with the used wood which caused me to take apart the frame and fix toe misaligned joints. 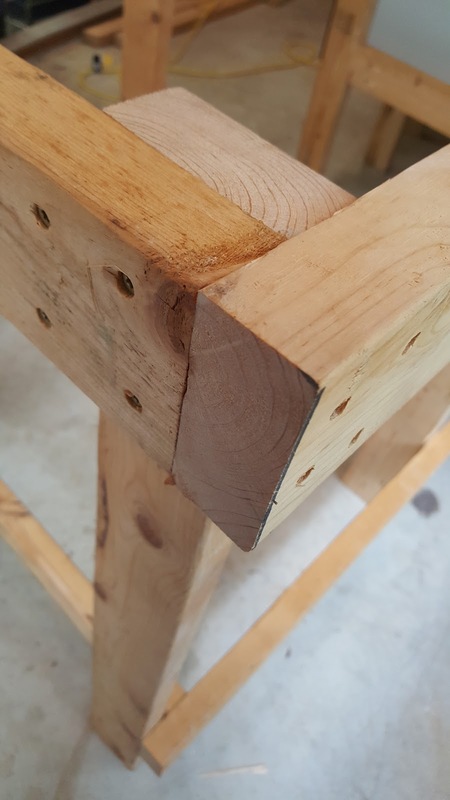 This is what happens when you are using old word that has bowed and is not fresh cut select grade lumber. Not sure how this happened. It was easy to fix since I was using deck screws to make all of the joints. Not the corner is flush and square. Here is the frame of the first work bench with the office desk drawers installed. 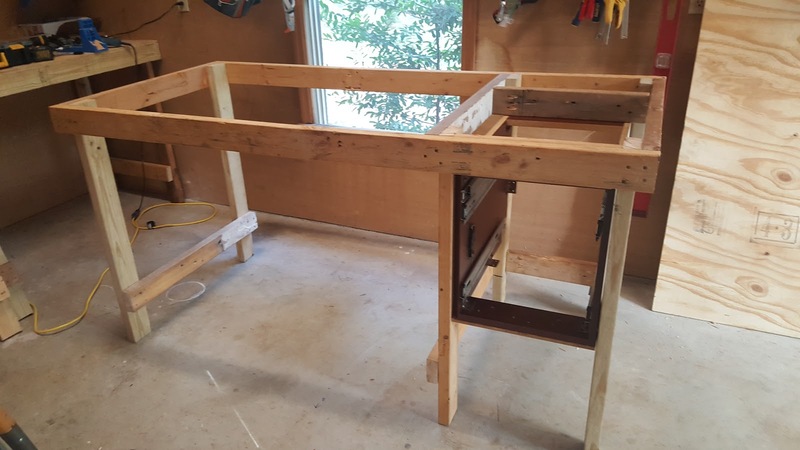 I watch a lot of Youtube wood working videos. I have picked up a lot of ideas from April Wilkerson. One ogf her ideas was to add a clamping area on the front of the work bench so I did. 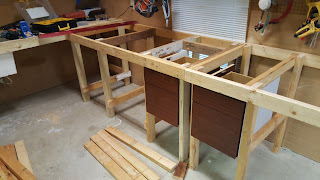 I ran out of weekend and did not get started on the two large drawers tat will go in the work bench frames. 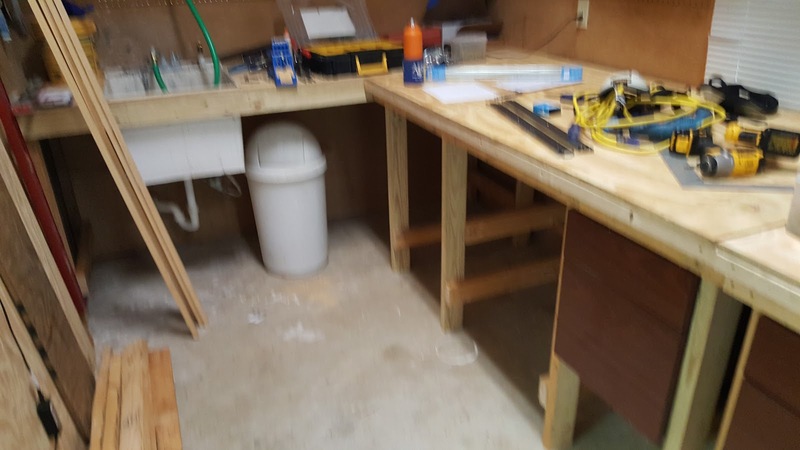 I cut the plywood tops, but I did not screw them down. I will attach the tops after I get the drawers built and installed.